Just flicking ahead to see what films the TV has to offer us in a world where we all have DVDs, Blu-rays and downloads (and of course here I'm talking about BT Vision and iTunes ...). The Dark Knight is on SKY on New Years Eve and has been awarded ... 3 stars out of 5. Hmmm .. well I find that hard to agree with, but I guess the standards must be really high ... oh no .. wait a minute ... Superman Returns and Hellboy 2 get 4 stars ... that just doesn't add up. Superman 2 just didn't do it at all for me ... and whilst Hellboy 2 looked fabulous ... the story wasn't what I'd call an all time classic. The Dark Knight however worked on all sorts of levels ... it's one of the few films that I've ever seen where I'm sat there as the credits roll and just think 'Wow'. As for Radio Times .. you need to get some consistency across your reviews ... I can only assume that the guy who reviewed The Dark Knight has much much higher standards than the guy who reviewed Hellboy 2 ... oh .. wait a minute .. the guy gave 4 stars to Shrek .... sigh. I'd like to thank all those who have supported us over the last year, either with contributions to our books, advice, feedback, reviews or just words of encouragement. It all helps and is great appreciated. Firstly a podcast interview, which also gave me a chance to chat to the guys over on Tales From The Parent's Basement, can be downloaded over on http://talesfromtheparentsbasement.com/ and secondly an interview conducted by email can be read over on http://www.sfsite.com/columns/booknews310.htm. I tried to sound lively and energetic on the podcast but I'm afraid my natural character kept breaking through .. still ... hope you enjoy it ... it was fun to do. OK .. so 'K' had to be Kingdom. 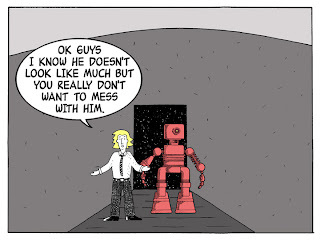 Kingdom first appears in the ROBOTS anthology, and his look is pure INDIO! 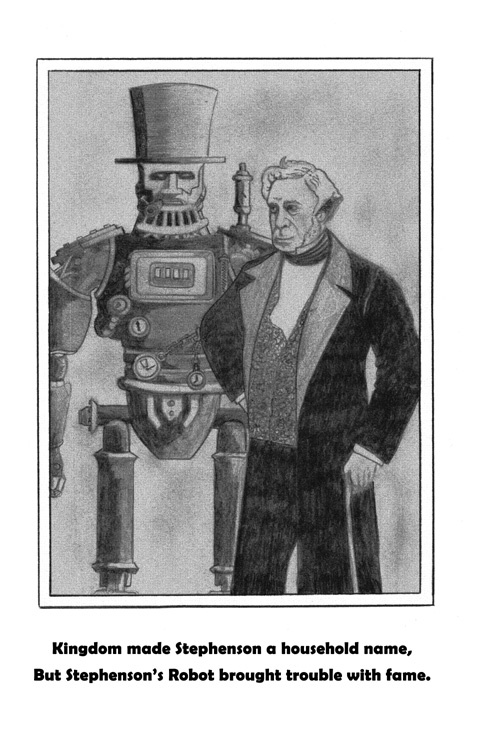 We liked the whole set up to much that we then drafted in Jon Ayre and together wrote a 7 issue mini-series around him ... titled Stephenson's Robot. 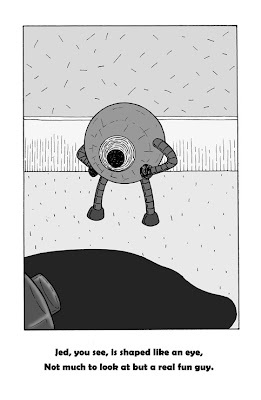 This will be a full colour production, the first issue is already coloured and issue 2 is fully inked and awaiting colouring. It looks really amazing and allows INDIO! to show just how damned talented he is. 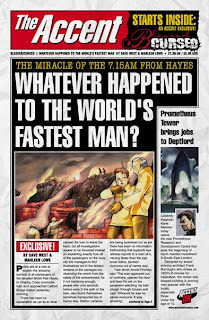 In other news here's another review of Whatever Happened To The World's Fastest Man ? Check it out ... http://www.newsarama.com/comics/091103-Best-Shots-Advanced.html, although I do seem to have trouble accessing the website at the moment ... maybe I imagined it after all. It's been a busy few weeks, October and November being Comics Convention season over here in the UK are typically busy, but this year we've added to the problem with Whatever Happened To The World's Fastest Man ? hitting the November's Diamond PREVIEWS catalogue. Good news is that it has been given a SPOTLIGHT box around the listing, which will hopefully raise it to the attention of retailers as they make their orders. Bad news is that the same PREVIEWS catalogue has so may cross over events from DC and Marvel that I can see the retailers having very little spare cash with which to try something new, which is probably the DC/Marvel plan. Still, we've emailed reviews and low res PDF link out to about 800 retailers across the globe, mostly in the USA, so we'll have to see. I'm off to a DAMA conference next week ... nothing to do with LOST I'm sorry to say, just a Data Conference ... to do with the day job ... sigh. ... Thanks Jason .. I'm glad you enjoyed it. 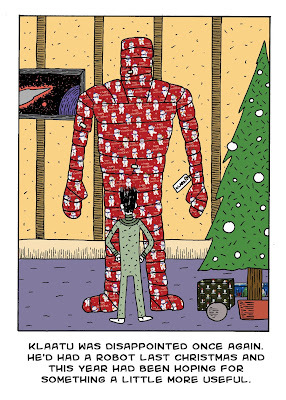 ... from the guys taking shelter in their Parent's Basement over there in the US ... http://talesfromtheparentsbasement.com/reviews/?p=153. We've managed, thanks to Diamond UK, to get 4 pages ... yes ... 4 whole pages in the MCM Expo Booklet ... you can check it out yourselves http://www.myebook.com/index.php?option=ebook&id=17552 ... we're at the end of the book .. where people tend to start their browsing ;o) Thanks go once again to Andy Bloor for designing the 'advert-that's-not-really-an-advert' page. Also Fastest Man is still getting plugged over at http://www.hypergeek.ca/ as we near the November Previews. 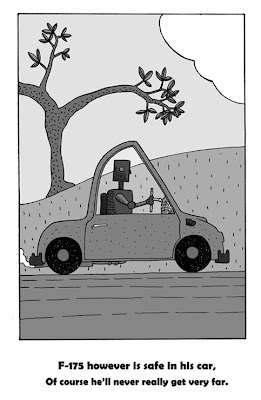 Strange Times Book 2 .... in progress ... honest. Just recovering from a really busy and productive BICS event. Sold a good number of Whatever Happened To The World's Fastest Man ? 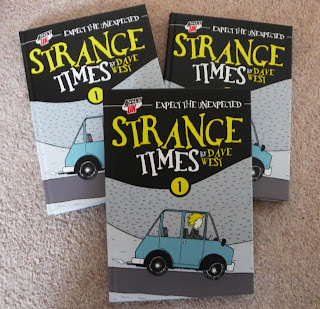 and even some copies of Strange Times Book 1. GOSH Comics in London took a few copies of the latter for their store as mentioned on their blog http://goshlondon.blogspot.com/2009/10/gosh-authority-071009.html, you'll have to scroll down the full entry for The Gosh! Authority 07/10/09 but it is there :o). It was great to meet so many people I'd only ever spoken to electronically and I'll apologise now to anyone who I may have blanked a little ... I'll blame it on my state of mind over the weekend, the poor lighting and my age ... I've already apologised to one person by email (Sorry again Mr Hughes) ... hopefully I didn't do it to anyone else. 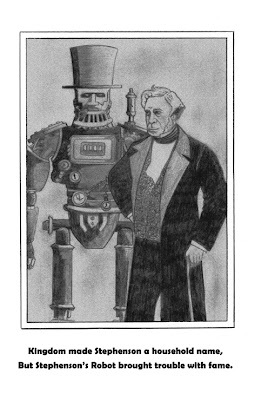 I bought a few books over the weekend and so far have read Grandville from Bryan Talbot and Thomas Wogan is Dead from Dave Hughes. They're very different and both a very good. 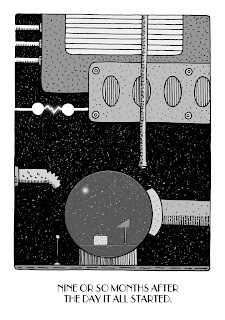 .. collects some kind words from Garen Ewing over on his blog ... just follow the link on the right for his view on the little book ... Thanks Garen. Next weekend Comic people gather in Birmingham. Yes ... it's here at last ... next weekend Accent UK will be travelling to Birmingham for the annual BICS event. This event just gets better every year and gives us all the opportunity to meet up with comic creators and buy some of the stuff we've been reading about on the web. I can't wait. If you're at the event do pop over to the Accent UK table, which we're sharing this year with Garen Ewing (of Rainbow Orchid fame) ... did I already say ''I can't wait !''. Well ... here's 'D' ... as I mentioned before ... best go to the bottom .. 'A' .. and read the entries up from there. 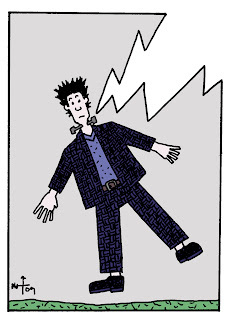 Been a busy week colouring in our first 'colour bi-monthly' mini-series comic. It won't be appearing for a year yet, as there are 7 issues in all and we want to have 5 or 6 complete before we print issue 1, but it's building very nicely behind the scenes. You can check out page 1 by following INDIO's blog link on the right. Well it has arrived ... or perhaps I should say ... they have arrived. 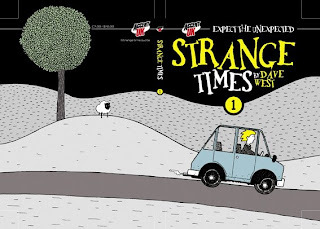 I've had 100 copies of my hardcover collection of the Strange Times webcomic printed at MPG Biddles ... 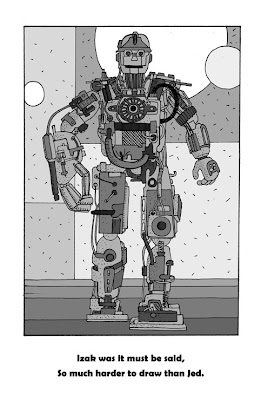 I've had to greyscale it for cost reasons but it looks really great ... thanks to Andy Bloor's work designing it from cover to cover ... asking for extra doodles here and there ... and generally nudging me along the way to get it done. 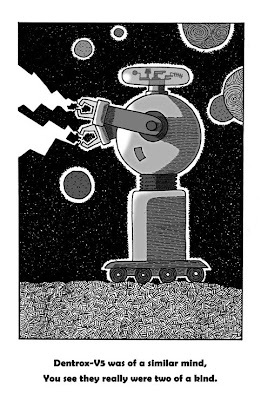 The book contains all pages on the web (and a few that aren't there yet), extra pages here and there, pin-ups from the likes of Andy, Garen Ewing, Shane Oakley, Colin Mathieson, Will Kirkby, Dave Hughes, Steve Holder and of course INDIO. It also contains a 'not to be seen on the web' Secret Origin of Mr Rock special feature ... who could resist ... oh yeah .. also .. I've put it all in chronological order ... starting 9 months after the beginning, going through the days it all started and ending a thousand or so years into the future. If you're at CAPTION then Colin Mathieson and I will be there for the Saturday ... and we'll be staying for Garen Ewing's talk ... which is 5.30pm to 6.30pm I believe .. see you there. Rainbow Orchid Discovered in Stockport. Well the wait is over. 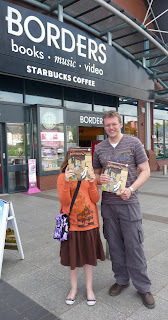 I finally got my hands on a copy of Rainbow Orchid, an adventure graphic novelfrom good friend Garen Ewing. In fact I bought my daughter a copy too, as when she reads a book she lives with it .. it ends up collecting food, folded (groan ..) corners, spends the odd night under her sleeping body and finally ends up on the floor of her bedroom amongst other well loved books and soft toys. My copy however will be read wearing cotton gloves ... in a room that has had all moisture removed from it and will then find its way onto a book shelf .. well .. OK .. maybe the bit about the cotton gloves was a lie but the rest is pretty close. It's a fabulous looking book .. the production is glorious ...the design excellent ... the story and artwork I know are top notch as I have a few versions of this as it has pulled itself through and then out of the Independent Comic world and into the welcoming arms of Egmont. As I paid for my copies (and actually went back for a third as BORDERS seems to have a 2 for 3 deal on) I spoke to two of the staff, as it went through the tills. 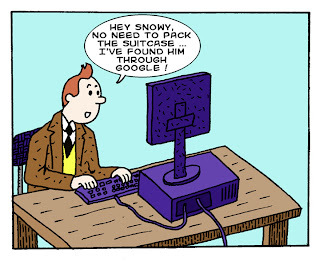 Both said they'd not noticed it, both said it looked great, very TinTin, and that they'd have to get a copy. This book is going to do exceptionally well ... and deserves all the success it gets. The only thing left for me to do then was to pop back to the shelves to do a bit of re-merchandising (I moved a couple of copies into a more prime location at the end of the aisle) and then get home as quickly as possible so that I can read it. Well, I came across this posting as a Comment on Andy Bloor's Blog ..
'' I am attempting to amass a large collection of portraits of Frankenstein's Monster in as many different styles and in as many different media as possible as an ongoing art project. The only stipulation is that the size is 2.5 inches by 3.5 inches (standard artist trading card size) and that each card has name, date, location, title and anything else you care to add on the back.I welcome cards from both amateur and professional artists.I will be leaving blank cards with instructions and mailing address in galleries, colleges, art shops, on buses, handing them out in the street and wherever else I can think of.If you think you can spare the time to produce a little something, please send a portrait to:A Patchwork Of Flesh45 Silversea DriveWestcliff on SeaEssexSS0 9XDUnited KingdomEach card I receive will be uploaded at http://apatchworkofflesh.blogspot.com/ to produce an on-line gallery, I then hope to put on an exhibition of these cards in a gallery''. Kind of broken my own little rule for this blog as this artwork hasn't been created by me ... but I did write the story .. so I'll let myself off .. artwork is in fact by Marleen Lowe. 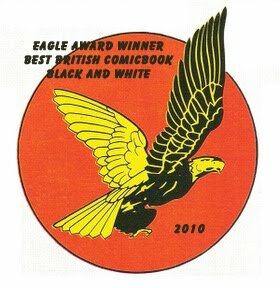 Pop over to Accent UK Comics website (http://www.accentukcomics.com/) and follow the REVIEWS link from the ''Whatever Happened To The World's Fastest Man'' page (just click on the cover image on the home page) to read the full reviews. 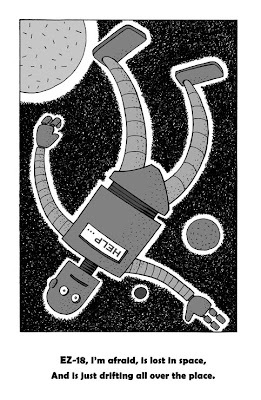 I'll be sending a hidden link page to the full comic to a number of REVIEW websites over the coming weeks ... try to raise its profile before talking to Diamond Distribution about listing and hopefully shifting copies of it. Last week I saw one of the real benefits for the World Wide Web. I'd lost contact with a good school friend some time ago and despite joining Friends Reunited I've had no luck tracking him down. OK, I guess I could have tried a few more things but at the end of the day I'd no idea if something had happened to him or whether life just got in the way but I stopped getting Christmas cards and the like some 10 years before. Then I decided, following a suggestion from a friend at work, to try and Google him. Well .. he did have an fairly uncommon name, I knew he worked in 'electricity' and I knew he was based in the South East of England ... well ... the latter two were true 10 years ago anyway. So, armed with these three pieces of information I tried it. 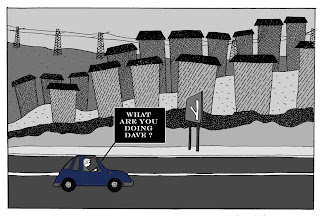 On the first Google page was a link to a website from one of the major electricity suppliers ... based near Bexleyheath ... OK ... maybe I'd struck lucky. I emailed the guy with an, 'I've lost contact with an old schoolfriend' email ... and waited. And didn't have to wait long before I got a reponse. I'd struck lucky .... he was OK .. his family were OK ... great news all round and a happy ending. So ... the internet does have it's uses after all. 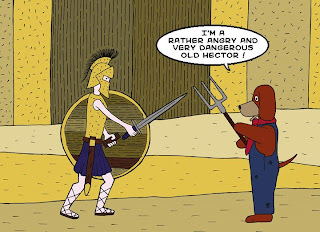 I always find I'm laughing to myself whenever I hear the name Hector used to describe a famous Greek hero. I mean ... Hector ... come on ... shouldn't a hero of Greece have a name that ends in 'us' or 'es' ? Wasn't Hector just a dog who lived with a cat and next door to a lady frog ? 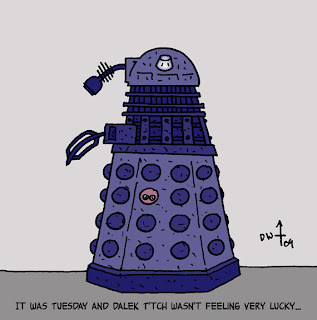 Had an email through Facebook from Andrew Cheverton ... not really sure what it's all about by Andrew was encouraging us to have a go at drawing a Dalek ... so I quickly pulled this together ... now I need to work out how to respond to Andrew's posting .. with the image included ... sometimes I feel left behind by it all ... sigh. It's been a busy few weeks, and I didn't really see myself actually doing any drawing until the middle of June. Little did I know however that on accompanying my daughter's class (well some of it) to Granada (Spain) as the responsible male adult (well .. two out of three ain't bad) I would find myself drawing 'Falling Frogs' for Spanish 9 year olds. The idea of the 4 day trip was to visit a Spanish school, give the British kids a chance to mix and speak some Spanish, by attending a class. So the kids were split into groups of three and an adult (typically a teacher) would then accompany the group and spend the day with them in the class with the Spanish teacher and 30 odd Spanish children. I accompanied three of ours as we were taken into a Year 3 class. All was going pretty well until they started showing me their English work books. I commented on how good they looked and handed them back after flicking through and picking out the odd word or image in each for special mention. After a while one of the kids pointed out that the teacher from the previous visit had written something and drawn a little rose on the page. It looked like she expected the same from me. Hmmm ... 'Would you like me to draw in your book ? ', I asked (in English I'm afraid) .. to which the girl, with a very serious little expression, nodded. A short while later another girl come along with her book and said something about 'rana' which my biology days informed me was probably 'frog', so I set to work in her book. Half way through her little sketch I looked up to check it was what she wanted and was startled to see pretty much the entire class stood in a queue behind her. All with their English work books to the ready .. this must be what it feels like to be a proper artist at a comic convention. Well ... I got the rest to return to their desks, so I wouldn't get in trouble from their teacher and then went around after finishing the drawing I was working on. As I finished each one another child would rush over to get their's done .... 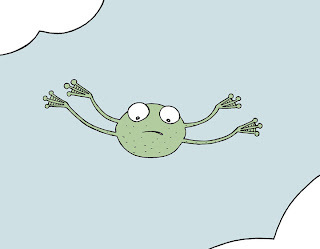 I must have drawn about 20 falling frogs in all. 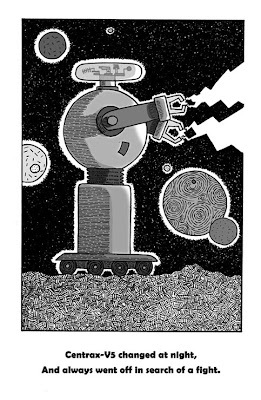 I was tempted to change the drawing to a Robot half way through, but was worried that I much get some of them coming back for that too. This weekend I helped out at a Scout Camp. It seemed only fair that I chip in as my daughter is a member and gets a lot from these weekends camping out, climbing walls and all sorts of other activities. Scout Camps however, are notoriously hard to find. I guess if you can't find the camp then you don't deserve to be a scout ... anyway ... I was never a scout and so I don't have an 'orienteering' badge but what I do have is a Sat Nav. The Sat Nav didn't let me down and where other people had ended up getting lost down single car width, pot hole ridden, tracks I got there without much of a problem ... OK ... we did have to turn around once or twice ... but no scratches were collected and no parts of my car now litter the country lanes outside Stockport. Coming home however I had one of those moments when something happens and your mind is taken to a completely different situation. I had decided to try to switch my Sat Nav off ... it had taken me back to known territory, so although not quite home I now knew the way. It didn't want to be switched off however and kept trying to take me to another motorway. I half expected it to start speaking in HAL's voice from 2001 - A Space Odyssey. 'I'm switching you off ... I know where I am now'. 'I'm not going to let you do that Dave'. .. anyway ... I didn't want to stop the car and work out how I could be pushing the wrong button ... there is actually only one, and if it was anything like the film then it would have tried to stop me anyway ... so I listened to it all the way home ... eventually it realised that I wasn't going to go back to a motorway and started giving me the correct directions. 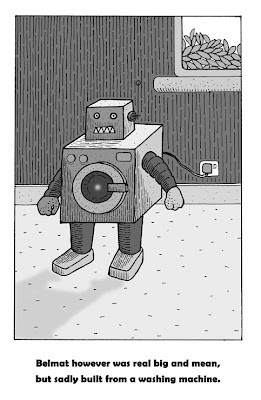 It did get me wondering though ... if we did have to persuade all of our little helpful gadgets to be helpful ... if their programming did fail .. or .. rewrite itself ... we do tend to rely on these things a little too much. A few generations down the track our decendents will be all the more dependent ... and maybe all the more at risk. The Day The Earth Stood Still .... again. Back in 1951 Robert Wise made the inspired The Day The Earth Stood Still. It had it all. 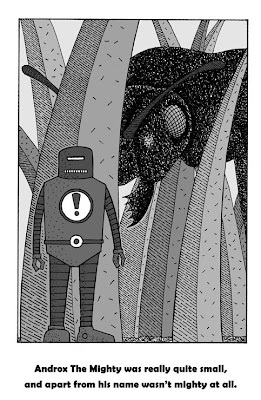 Iconic robot Gort, strange almost-but-not-quite human Klatu and a message that played to the fears of the time in which it was made. Wonderful. So why of why did they decide to remake it in 2009 ? I've read nothing good about the new version. I refuse to give any of my hard earned cash to support this sort of thing. There are a hell of a lot of good books out there just crying to be turned into a movie, so why not do one of those ? I didn't see this at the cinema and now it's come out on DVD I've decided to give that a miss too ... maybe I'll be tempted when it's in the £2 bin. Was Dr. Black actually murdered ? I was playing Cluedo the other day, my daughter loves it, and it suddenly occurred to be, as we were all rushing from room to room .... had anybody even seen the dead body of the so called Dr. Black ? Was this in fact all some elaborate plot to have a group of friends turn on one another ? As we were informed from the offset that one of use had murdered Dr. Black ... wouldn't we eventually find one of us to be guilty ? Whether they actually were or not ? ... I mean ... our fingerprints would be on most weapons ... our footprints in every room and corridor ... no ... I think it's all some kind of test ... and I refuse to be a part of it ! This BBC 3 series had been recommended to me by a few people, but I was still recovering from the mess that was the ITV series Demons, of which I survived a whole episode, and so avoided it. For a while anyway. Then I found myself reading the back of the DVD case in a local 'DVD and Music' Emporium and .. well .. it sounded interesting ... next minute I was walking out of the store with it in a DVD Case sized little bag. I watched the complete 6 episode series over the next three evenings ... and ... well it's not that bad ... in fact it was quite good. I wanted it to take a darker deeper and less predictable direction, but the direction it did take was actually far better than many that it may have selected. 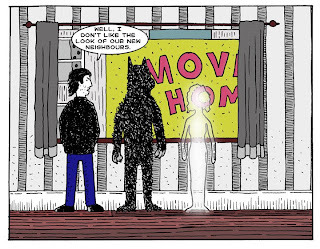 So, you have a house that is shared by a Ghost, a Werewolf and a Vampire ... what could go wrong ? Each episode tends to focus on one of the main characters, so we get to learn how they came to this point, but even the 'origin' stories were done in an interesting way. Understated, as are most British dramas, we had the usual 'bad guy with his big plans' but this bad guy wasn't your all powerful demon, but merely one of the head vampires .. and he was a 'manipulative' rather than 'rip throats out' kind of monster .. although he did that too at times. Yep ... I've put this on my 'keep' pile and am looking forward to season 2. Well, I've seen a couple of trailers now and I'm convinced. 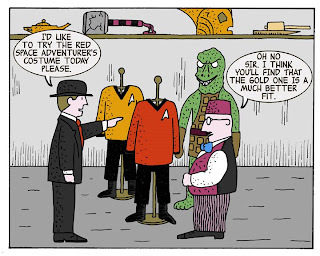 The new Star Trek movie is going to be great. I grew up with Star Trek ... and I mean the original series ... this film has every chance of resurrecting the whole franchise, not that I thought Enterprise was bad but interest in the whole Star Trek universe has diminished series by series until the current all time low. 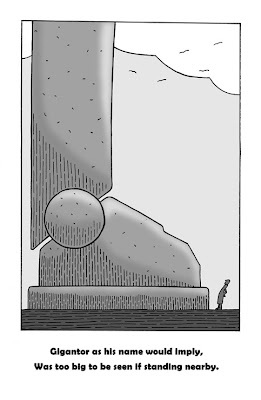 Another childhood hero of mine was Mr Benn ... and so it seemed appropriate that I combine the two in a little cartoon. The chapter title pages for my little Strange Times book. 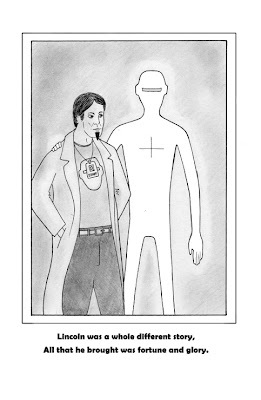 Well, the Strange Times story, yes, there is a story here, moves back and forth through time a little and I needed to come up with something that'd work for the image on an otherwise quite boringly sparse chapter title page. 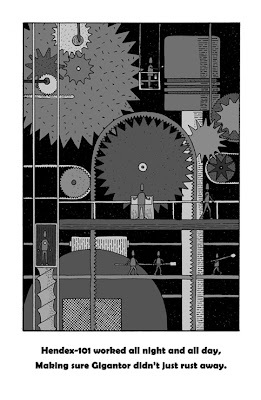 I must admit to struggling with this until it occurred to me to use an image of Samuel Close's Time Machine itself ... showing the passage of time by showing the stages of its development. I must say I'm quite pleased with the end result ... or initial result ... hmmm ... that's the trouble with time travel I guess .. one paradox after another. When will we ever learn ? I'm always surprised when I see reports of man playing with the natural balance of things. There are plenty of examples where man has moved a certain species from one continent to another in order to solve a problem, or merely for sport, and the result has been disastrous. An example of this is the case of the Wild Pigs Of America. The U.S. government estimates that there are more than 4 million wild pigs scattered throughout 40 U.S. states. These pigs were introduced into America by Hernando de Soto in 1539, then hunting enthusiasts released German wild boars into the wild in the 19th century, and Russian wild boars were released across several southern states in the early 20th century. What seemed like a pretty good idea at the time has resulted in an ecological disaster, with the pigs devouring huge amounts of crops, tearing up plants, and driving out native wildlife by outcompeting them. The problem is so bad in some places that there are actually federal teams of hog hunters armed with machine guns, which is probably seen as great fun by the guys with the machine guns. The problem is that the pigs have no natural predators, other than man, and so they are able to spread quickly. Not only that, but they may spread disease to humans, as well as livestock and pets. Yep ... a complete mess caused by man. So, what's the story with Cane Toads then .. oh ... Cane Toads were introduced into the sugar cane growing state of Queensland in 1935, to combat the cane beetle, a pest of sugar cane crops. However, as the toad is not native to Australia, it has no predators, and has since spread across most of Queensland and almost entirely across the Northern Territory, including the world-renowned wetlands of Kakadu. You see there are plenty of creatures who will eat it, but none who can survive its poison and live to eat more. Right. So, here we are talking about introducing 'Meat Ants' into Australia (New Scientist Apr 09) in order to control the spread of toxic Cane Toads. The ants aren't affected by the toxin and so the toads are fair game. Once the population of Toads declines though and the Ant numbers increase, won't the Ants go looking for other prey ... hmmm ... sounds like more trouble to me. Best check that the Meat Ant has a predator in Australia before you introduce it huh ? Does this remind anyone else of the old story about the Old Woman Who Swallowed A Fly ? Following a recommendation from Andy Bloor, I picked up the first issue of the second series of Locke & Key, and am hooked. It's great when you discover something new, that already has a bit of history, as you can then seek out previous issues and works by the creator. Joe Hill the writer of the comic also writes books without pictures, and a quick visit to my local Waterstones scored a hit on both counts. So I was in possession of the hard back collection of Locke & Key series 1 - Welcome to Lovecraft and also his horror book The Heart Shaped Box. As it was the former that hooked me in the first place I started with that. 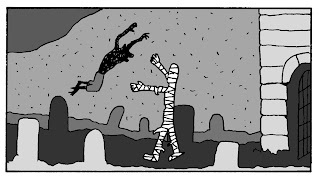 It's really very good, and startlingly it's his first comic work I believe. Great characters, character development, well paced, well written (not just formulaic story telling), an interesting story set in an even more interesting environment (the mansion is fabulous with its history and secrets) ... with a back story that is there just waiting to pounce. Can't wait for the second collected volume. Whilst I'm not a big fan of horror I really enjoyed The Heart Shaped Box too. An intriguing idea again, and again great characters develop through the story through a number of twists and turns until the end ... which I thought I'd worked out but happily was wrong about. Recommend you look this up if you get the chance. A pill to treat the healthy. I read in the New Scientist (4th Jan 09) that they've now invented a pill to prevent a number of possible illnesses from occurring, and are praising the fact that they can squeeze all of this into a single tablet. Maybe I'm being a cynic but is this just the pharmaceutical companies trying to squeeze more money out of society. Have they 'maxed out' on profits from people who need medication and are they now turning their attention onto relatively healthy people ? Seems that with the first pill it will replace three or four others, but taken to its extreme it occurred to me that it'll end up as one huge pill if it's going to cover all of the bases.